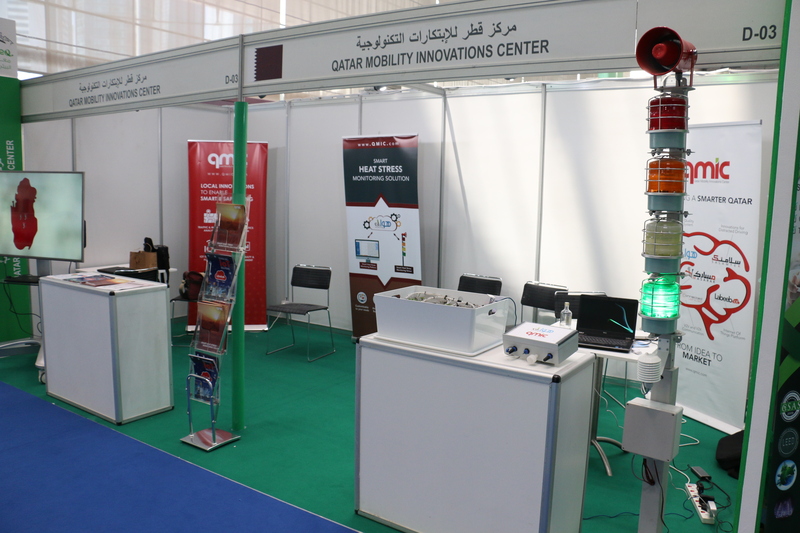 Qatar Mobility Innovations Center (QMIC) announced the launch of its Smart Heat Stress Monitoring Solution, the latest addition to its innovative suite of smart solutions built using local technologies and know-how. This announcement coincided with QMIC’s participation in the Enviroteq exhibition being held in the Doha Exhibition & Convention Center. This solution is considered the first of its kind in the region, and provides a smart, automated and comprehensive system for observing heat stress to support workers’ occupational safety, in particular, and public health, in general. The solution overcomes the shortcomings of current monitoring methods through integrating QMIC’s innovative monitoring stations with its smart IoT platform for data storage, management, and delivery. The main objective of this solution is to monitor and calculate the Heat Stress Index (HSI) in real time, which is the global standard indicator to determine the effect of heat on the human body. If HSI exceeds a certain specified limit, the weather is deemed too dangerous for manual labor and all work must be halted. HSI monitoring has been covered and identified by the Ministry of Labor in Qatar as one of the most vital safety precautions that all worksites must abide by. The platform utilizes the power of Internet of Things (IoT) to analyze information from dedicated sensors (which are designed and built by QMIC) that automatically collect relevant data such as temperature and humidity to calculate Heat Stress Index (HSI). Data is continuously transmitted from the sensors to QMIC’s Hawa’ak platform where it is transformed from raw data to comprehendible information to be accessed by worksite safety managers and other relevant personnel. The solution features several methods of delivery for important information, whether it is via email, text message, phone application, or the desktop portal, the safety officer will always be aware of the weather conditions at each site. The solution consists of one or more Main Stations and one or more Repeater Stations deployed strategically at the construction site. The Main Station has sensing, computing, visualization, and controlling capabilities, it senses both local temperature and relative humidity and calculates the Heat Stress Index in real time and visualizes the severity of the heat stress using built-in high intensity colored lights (instead of the traditional manual flag system). The change of state is mirrored to all Repeater Stations within the site. The platform can provide value throughout various sectors of the market. Virtually, it can work in any outdoor setting to protect and ensure the safety of individuals. It can be installed across a wide array of environments from school outdoor playgrounds, to construction sites or Oil & Gas fields. The solution is easily customizable to fit the needs of each party individually. © 2019 QMIC : Innovative Solutions to Enable Smart Living. All rights reserved.